We take much pride in our infrastructure. The systems powering Status.io span across multiple regions and providers. Match your brand using simple design tools. Or go all out and bring your own code. Full support for complex distributed systems and multi-tenant infrastructure. Most companies set up their status page in less than one hour. We're always building and shipping. Expect constant improvements. 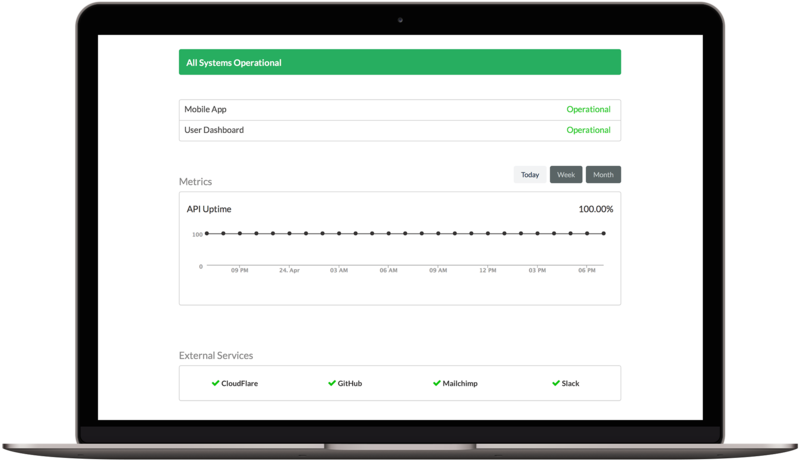 Every status page comes with a unique API method for API consumers to retrieve the current status. Librato, New Relic, OpsGenie, PagerDuty, Pingdom, Pingometer, Twitter and Uptime Robot. Provide the ultimate source-of-truth for your system's current status. Keep your users in the loop during outages and planned maintenance. Customizable to match your brand. Incidents are the best way to track an issue such as a service disruption. Updates trigger notifications and the appropriate components automatically reflect the current status. Schedule maintenance activity in advance. Reminder notifications are sent to subscribers prior to the maintenance start time. Past events are viewable on the status history page. Keep everyone in the loop during events. Send unlimited notifications. You're only limited by number of subscribers. Deliver notifications via email, SMS, webhook, RSS, iCalendar, IRC, HipChat, Slack and Twitter. Metrics power the live charts on your status page. Pipe in your data via our Custom Metric API or connect external data sources such as Librato, New Relic and Pingdom. Match your brand with our design tools. Re-position page sections, upload graphics, change the color scheme and more. Or go all out and inject your own custom HTML and CSS. Robots want to know your current status too. Provide your API consumers with a simple GET method that always returns the current status. Your status page must always be available . That's why we use infrastructure spanning across multiple regions and providers . Upgrade or downgrade anytime. Annual discounts available. Toggle branding link "Powered by Status.io"